A warehouse mezzanine, or a structural mezzanine or an industrial mezzanine or whatever you would like to call it, is an intermediate floor (or platform) in-between the bottom floor of your warehouse and its ceiling. The mezzanine will typically have a stair system that is attached to one of the sides of the platforms, or can be built to come up through the middle of the mezzanine platform if needed for space reasons. They are standard engineered to hold 125 pounds per square foot, but can be reinforced to hold increasing amounts of weight. Also,the mezzanines are furbished with one of these five decking options: Advantech, Resindek, grated steel, diamond plating, or concrete. 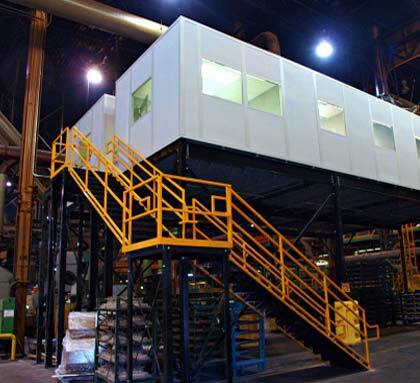 Overall, mezzanines offer warehouses a great way to make the most out of their overhead room. 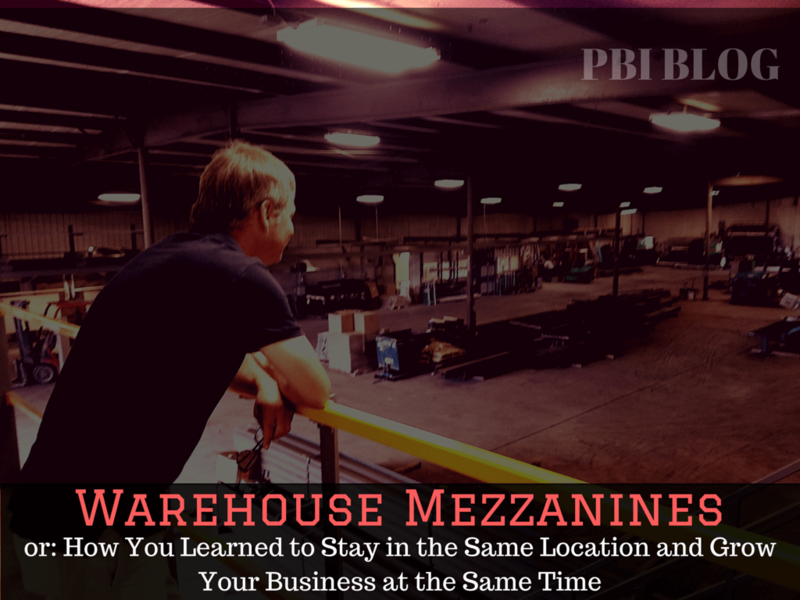 Inevitably, after installing a mezzanine into your warehouse, you will probably find yourself wondering why you didn’t think of this sooner. The new mezzanine will provide you with a convenient, new storage space that can practically double the area of your warehouse. Now you will not have to worry about the clutter and messiness of your warehouse, instead you’re going to need to figure out what to do with all of this new room! 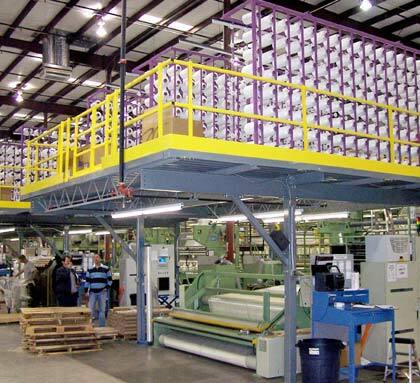 For the majority of companies, a mezzanine provides them with more room to place materials and product. However, mezzanines can easily be multipurpose to perform various functions in different settings. We have created platforms to be used to work on passenger airliners and locomotives. We’ve made catwalks that span entire factory floors, making employee transport safer and easier. And we regularly engineer modular offices on top of mezzanines that can easily weather a factory or warehouse environment. How does this Benefit You & Why is it all important? By choosing a mezzanine to fix your storage problems, you avoid three main issues that you would otherwise incur. The first two problems are the added time and money involved in adding on to an existing warehouse or, building a new, larger warehouse all together. 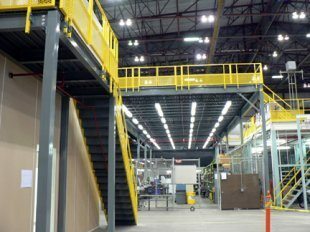 For us to design, manufacture, ship, and install a mezzanine in your warehouse, it will typically take anywhere from 4 to 6 weeks lead time, whereas building on to or building a new warehouse could take multiple times longer. Plus, the mezzanine will only cost you a fraction of the price of a new warehouse. But to add on top of all of this, one of the biggest benefits of installing a mezzanine, you do not have to move your center of operations. At first you might be thinking, so what? How much does all of this really help me? Well, I’m glad you asked! Even if we look past the money you will save in construction costs, cost of the new land, and the possible increase in property tax, you will save money on the transportation of materials, workers, and you get to keep your rapport in the local economy/environment. All the relationships that have been built up between your business and the locals will remain untouched. Any friction that you would incur by transporting materials to a whole new warehouse would be reduced to a small portion of your good to an upstairs level, freeing up more room below. Plus, your employees would not have to relocate or, even better, you get to keep the exact same employees all together. Overall, a structural warehouse mezzanine provides you with a fantastic alternative to freeing up space in a warehouse setting. With a short lead time and easy install, you can have your warehouse nearly double in size in no time. If you want to learn more about our mezzanines, or start a mezzanine project of your own, contact our sales team, or request a quote on our site. A warehouse mezzanine, or a structural mezzanine or an industrial mezzanine or whatever you would like to call it, is an intermediate floor (or platform) in-between the bottom floor of your warehouse and its ceiling.